When on 9 November 2014, Al Mawred Al Thaqafy (the Culture Resource) announced suspending its activities in Egypt, the news spread like wildfire. Many questions were raised about the decision and its timing. Given that the Culture Resource was no small part of Egypt’s cultural scene, such a commotion and raised eyebrows could only be expected. 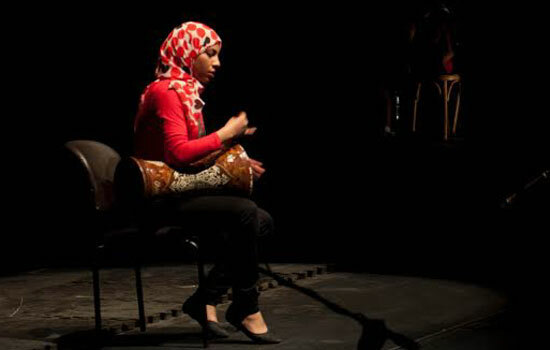 To the regular audience, the Mawred was recognised through theHayy Festival and CirCairo as well as the regional Spring Festival, alongside numerous musical and art activities, many of which take place at the El-Genaina theatre in Al Azhar Park, Cairo, as well as other locations. For Egyptian artists and cultural players, the Mawred was an important platform nurturing creativity through grants, workshops and seminars. It was a means for local and regional artists to perform and develop their talents, and an important knowledge source for wannabe cultural managers. The Mawred’s inclusive cultural philosophy also embraced underprivileged communities, giving them the artistic tools for development, of which the most palpable example is the Al Darb Al Ahmar Arts School teaching the circus arts to children and young people from economically deprived areas. All the Mawred’s programmes use the fundamental denomination of art/culture as a tool for reaching out, nurturing and developing civil society. The benefits of the Culture Resource make up too long a list and any description of the values they brought to Egyptian society would need a lot of ink to print. The history of the Culture Resource goes back to 2003, when a small group of cultural activists came up with the idea of establishing a non-governmental and non-profit Arab cultural organisation. The group was registered as a non-profit organisation in Belgium and began operating throughout the Arab region. Its regional office in Cairo was under the directorship of Basma El-Husseiny, a woman whose biography points up her involvement with the independent culture scene. In the 1970s and the 1980s, El-Husseiny was active in independent theatre. Her experiments led her to work in community theatres across many popular districts: Boulaq Al-Dakrour and Bab Al-Shareya in Cairo, where she worked on the folk tales told by the locals. El-Husseiny later found employment with the British Council, moving onto the Ford Foundation where she worked as a Programme Officer for Arts and Culture in the region. It was finally with Al Mawred Al Thaqafy, first in Egypt but soon after across the region, that El-Husseiny combined her passion for civil society and community welfare with the skills and expertise she had accumulated. Naturally, under her directorship, the Mawred excelled in Egypt, extending its field of activity to make a strong impact on the regional scene. El-Husseiny announced she would step down from the Mawred’s directorship shortly before the institution froze its activities in Egypt, but as a board member she remained in close contact with its activities while working on many new and fascinating projects. “We suspended activities in an atmosphere of uncertainty, at a time when many people felt threatened. In fact, we felt that continuing to work in Egypt might put all the staff in danger,” El-Husseiny explains, referring to the Law on Associations presented by the Ministry of Social Solidarity to Egyptian NGOs in mid-2014, when the ministry gave 10 November as a deadline for the associations and foundations to register under the new, more restrictive regulations or be subject to investigation and possible prosecution. Shortly, as briefed by Human Rights Watch Online (Beirut), the draft law aimed to regulate nongovernmental organisations by giving the government and security agencies veto power over all activities of associations in Egypt. The law “would empower the government and security agencies to dissolve existing groups, pending a court order, or refuse to license new groups if it decided their activities could ‘threaten national unity.’ It would allow officials to inspect the premises of any association suspected of engaging in the work of a nongovernmental organization. It would impose crippling restrictions on foreign funding of Egyptian nongovernmental groups and their capacity to communicate or cooperate with groups abroad. It would impose sentences of at least one year in prison and a fine of at least EGP100,000 (US$13,985) for infractions,” the brief reads. El-Husseiny explains that “this whole situation was particularly blown up in the media and we felt we had a responsibility to protect our staff. We didn’t stop our activities in Egypt, we only suspended them until we could figure out what might be done”. She adds that, in an ideal situation, such a law should not challenge the activities of any NGO so long as it does not call for violence or engage in corruption. With the Culture Resource closing its doors in Egypt for the time being, the management now moved principally to Lebanon, where the Beirut office is now in charge of managing regional programmes, though one programme also moved to Tunisia. Many of the Mawred’s activities – production awards, cultural management training, workshops, etc. – continue to take place at the regional level. The Spring Festival will continue to take place under the Culture Resource, regionally. 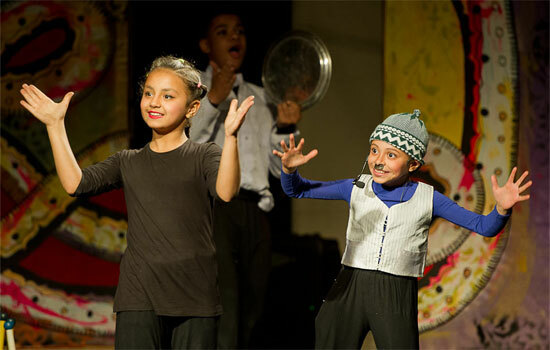 As for the activities held by El-Genaina theatre – the Hayy and CirCairo festivals and the Al Darb Al Ahmar Arts School – they are now disconnected from the Culture Resource. Those activities have now been placed under the umbrella of a newly established the El-Genaina limited liability company, headed by Ashraf Kenawy, the former director of El-Genaina Theatre. But the move to Beirut took several months and required much red tape. It wasn’t until July 2015 that the Culture Resource announced the launch of its Beirut office. “Beirut is a central city, well-connected with the region, with a good media environment. There is no reason why we should not be there if Cairo is not feasible at this moment,” El-Husseiny explains. It certainly hasn’t stopped the Mawred from pursuing its dynamic regional agenda. One remarkable project is the Masters Degree in Cultural Policy and Cultural Management, whose first students will start studying at Casablanca’s University of Hassan II this September. A trilateral memorandum of understanding was signed by the Culture Resource, the Faculty of Arts and Humanities at Morocco’s Hassan II University and the Cultural Policy Department of Hildesheim University in Germany. Hassan II University provides the basic academic staff for ongoing courses, in addition to courses given by the visiting professors, whether from Hildesheim University or elsewhere in Europe and Arab region. A handful of topics are taught by non-academics, practitioners in the cultural sector. But El-Husseiny stresses the fact that this is not the only culture-related MA in the Arab region. She points to other programmes, which are however limited to cultural tourism or cultural heritage and museums. The programme at Hassan II University will welcome a total of 15 students: five from Morocco and 10 from other Arab countries. Regionally selected students are offered a partial scholarship which supports their flight, tuition fees and part of their living expenses. The two-year MA culminates in a certificate accredited across many Arab and European academic institutions, allowing students to proceed with a PhD. 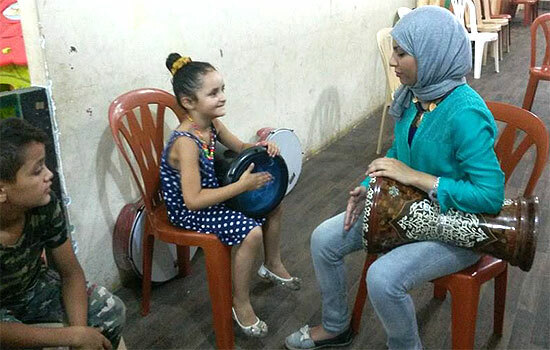 Though El-Husseiny no longer holds the director’s responsibilities at the Culture Resource, naturally she remains aware of its many activities. “Now I am only on the Mawred’s board and as such I’m probably a bit more distanced. I can tell you however that the Mawred continues its work on cultural policies. The full report on the cultural situation in the region is expected to be released this year. Imkan, a new cultural leadership training programme, was successfully completed very recently,” El-Husseiny says, also mentioning a new initiative called Tazamon (In-Sync) spaning three cities – Tunis, Beirut and Amman – that supports the work of young Arab artists. Tazamon will be linked with the Spring Festival organised by the Culture Resource in its upcoming, 2016 edition, which will take place in the three aforementioned cities. One initiative that seems particularly interesting is Tunisia’s Balad El-Fann, a pioneering cultural management training programme that brings together people who work in the Ministry of Culture (mostly the cultural houses across Tunisia) and the country’s independent cultural sector’s players. 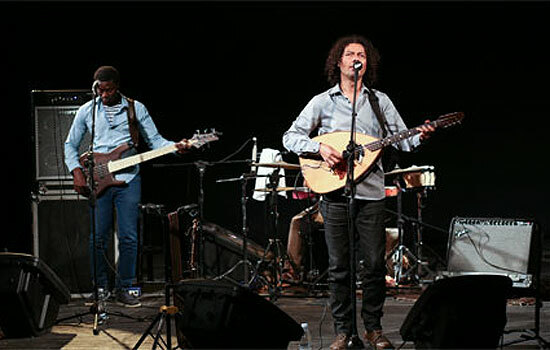 Executed with full support from the Tunisian Ministry of Culture, Balad El-Fann involves workshops in six different regions in Tunisia, which result in the participants working on projects that rely on cooperation on both sides of the line dividing governmental and independent cultural players. The best projects receive a grant $10,000 for their implementation. Involved in some of those workshops, El-Husseiny reveals many challenges that have cropped up in the process. 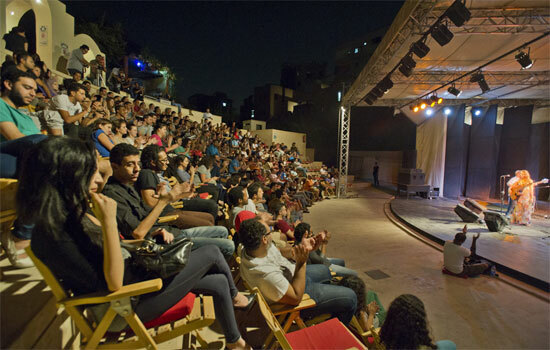 El-Husseiny gives an example of any state-run theatre festival in Egypt. Normally hundreds of employees are involved, most of them unaware of the bigger picture. She says the development of a successful cultural sector and successful work in culture depends on understanding the whole project. El-Husseiny concludes that the government structure in several countries in the Arab world somehow discourages this “general understanding” phenomenon. On the other hand, while she understands all the reasons behind the distance that independent players tend to keep from state institutions, she agrees that they should put their distrust aside and try to infiltrate state institutions. No longer managing the Culture Resource, El-Husseiny remains very passionate about its activities, and participates in many of them. Recently however her work in civil society took her to another fascinating initiative: Action for Hope. The programme’s pilot year was launched in early 2013, under the Culture Resource’s umbrella. “Action for Hope is very different to anything the Mawred has ever done before. The initiative’s main aim is to work with – and I underline: work with – communities in crisis, to strengthen them, using art as its main medium,” El-Husseiny explains, recalling that the pilot year touched on communities in Lebanon as well as Egypt’s Al Dowair Village in Assiut, Istabl Antar and Ezbet Khairallah, densely populated and underprivileged slum area in the southern part of Cairo. “This was followed by a transition period in 2014, in which the program was gradually turning into an independent organisation with a separate administrative and organizational structure,” we read on Action for Hope’s Facebook page. Finally, earlier this year, Action for Hope was registered – in Belgium and Lebanon – as an association with El-Husseiny as its director, with a board and members from Egypt, Lebanon, Syria, Switzerland, the Netherlands and Germany. On 18 August 2015, Action for Hope released a statement that read, “Action for Hope announces its official independence from Culture Resource. The independence is a culmination of two years of field work with communities suffering from difficult social and economic conditions.” Operations are covered through individual donations and help so far is provided mainly by the Goethe Institute and the British Council. “We are lucky that Action for Hope attracts a lot of attention as we work a lot with poor and underprivileged people, or with communities that suffer from war. On the other hand, this being a benign initiative, no one can claim that we support any kind of violence or anything like that. Also, we work with art and support the communities through artistic tools,” El-Husseiny explains. This year and the next, Action for Hope will focus on Syrian refugees. Apart from the palpable need for help, Syria also strikes El-Husseiny on the personal level. She recalls visits to the country with her father and then alone, and the many relations she developed with people there. When the crisis started and Syria made the headlines, El-Husseiny felt that this was the time to step in. Together with a group of people, she visited Syrian refugee camps in Kilis, Turkey and the nearby camps inside the Syrian border. There she noticed that, despite being isolated from the world, and subject to the Turkish government’s strict security measures, the camps had many of their needs provided in an adequate and humane manner. “Still, people in the camps were very sad; they felt forgotten by the whole world. In fact, this feeling has developed into the nation-wide dogma. Today many Syrians feel that the world doesn’t want them, or that the world would actually like it if they all disappeared. We saw this in Turkey, and it was my personal connection and feelings towards Syrians – not to forget the size of the tragedy – that moved me towards further infiltration of the Syrian refugee communities. There are so many tragedies around the world but this one is so close to us. Angelina Jolie seems to be doing more for the Syrian refugees than we. I felt this was the priority now,” El-Husseiny comments. El-Husseiny directed her efforts to two Syrian refugee communities in Lebanon. 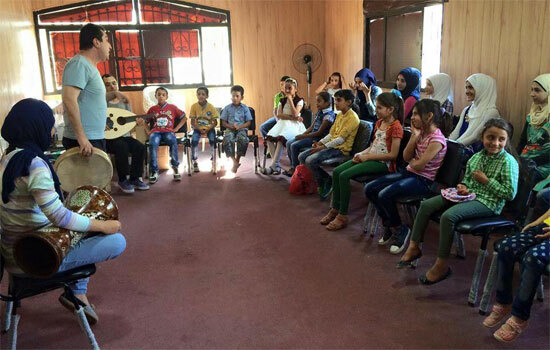 She decided to launch a music school that will provide permanent teachers and a curriculum; with locations in Qaa village in northern Lebanon and the Shatila refugee camp in Beirut, the schools will operate in rented rooms for 11 days a month, providing a total of 30 hours of teaching monthly. She explains that the model is partly inspired by Egypt’s Al Darb Al Ahmar Arts School, which aims to provide underprivileged communities with tools to help them develop and become professionals in art-related domains. “Most of the kids we teach in Lebanon do not go to schools or have dropped out of them; usually they work. Hence, the music school has to attract them in the afternoons and not full time. We brought many instructors from Europe but mostly highly qualified Syrian teachers. They give a few days of lessons which are then followed by the local Syrian teachers,” El-Husseiny explains that this pilot will function for five months before its first evaluation. El-Husseiny adds that the school aims first at the development of singing and percussion skills, then ear training and solfege. Since most children do not read and write, lessons depend on the memorisation. As she looks at all these accomplishments and initiatives, El-Husseiny is particularly passionate about Action of Hope. Its establishment included even personal sacrifices on her part. “I was at a point when I had to choose between pursuing a PhD programme in Germany, something that I would really have loved to do, or setting up Action for Hope as an organisation and devoting my time to it. The PhD was very tempting, but I also knew that this was the time I should focus on Action for Hope. Time is passing and even if all that we achieve is a drop in the ocean, if we do not focus on Syrian refugees in Lebanon now, we are going to lose at least 500 very talented kids in a year. So the choice was worth it,” she concludes, adding that she is already looking at Jordan as another potential location for Action for Hope, where they would work under the UNICEF. El-Husseiny hopes the day will come when she will be able to resume her work back in Egypt (and Sudan for that matter).